The MoveUVN command moves selected curve or surface control points along the u, v, and normal directions, or along control polygons. Click an arrow button or drag a slider to move a control point in u, v, or normal directions. Sets the scale for the arrow buttons and sliders. A value of 10 moves a control point 10 model units when you click an arrow button or drag a slider to the end. A surface has edit points that cannot be turned on. Every control point of a surface has an associated edit point. 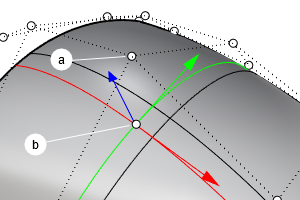 The Along Tangent mode moves a control point in the direction tangent to the UV isocurves or in the normal direction of the surface at the associated edit point. (b) represents the edit point associated with the control point (a). The arrows display the U, V and N directions when the control point (a) moves in the Along tangent mode. It is similar to curve control points. In the curve case, U is the tangent direction and N is the curve normal at the associated edit point. V is perpendicular to U and N.
The curvature graph of a curve draws the hairs in the curve normal direction. The u and v sliders move the points along control polygon chords. The control point will move along the imaginary extensions of the control polygon. Makes it possible to edit two sides of a symmetrical surface at the same time. You must select all points to edit. Use smoothing before MoveUVN to make it possible to combine the actions. Smoothing tends to even out the control point grid, and the other controls can be used for making small changes to the shape.